Desleigh Forster is looking forward to seeing new stable acquisition Cannyescent at Doomben. 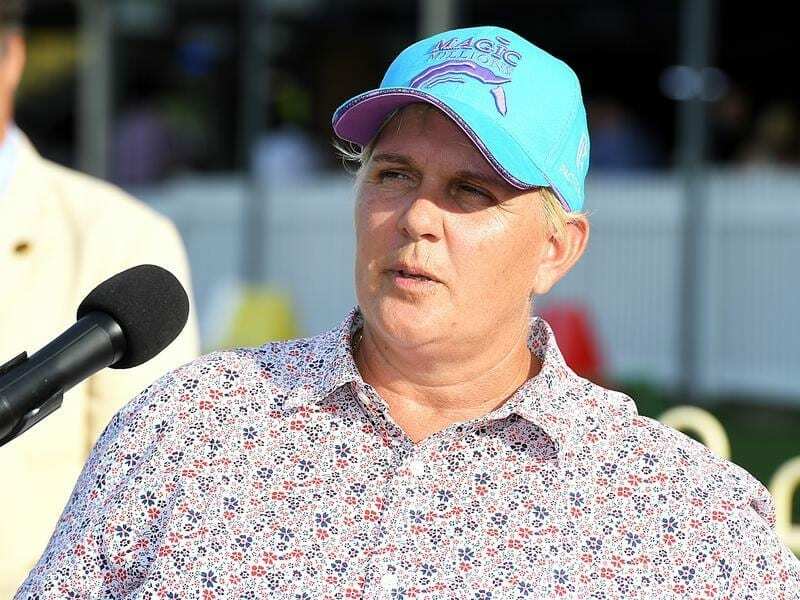 Trainer Desleigh Forster is taking a cautious approach to the comeback run of her new stable acquisition Cannyescent at Doomben. Cannyescent was originally trained by Gabrielle Englebrecht at Warwick Farm before a stint with the David Hayes, Ben Hayes and Tom Dabernig training partnership in Victoria. The gelding has won seven of his 21 starts and is a noted first-up horse with three wins and a second from five fresh runs. Cannyescent was sent north after finishing second-last in the Group Three Victoria Handicap at Caulfield in March. His record includes a second in the Group Three Aurie’s Star Handicap behind Hey Doc. Cannyescent will go into Saturday’s Open Handicap (1100m) without a trial and has drawn wide in barrier 10. But Forster said the gelding was ready to race well with some luck. Forster said she had got the gelding on the recommendation of one of her other owners. “They wanted a smaller stable where Cannyescent could get special attention,” Forster said. “He is a well performed horse and he does go well fresh. But we will be able to gauge where he is at after Saturday. “He is a get-back horse and sometimes that doesn’t suit at Doomben. “The Brisbane summer sprints look ideal for him and who knows next winter he might even be a Stradbroke horse. In bad news for the trainer, stakes-winning gelding Too Good To Refuse will miss the summer after pulling up lame at Doomben last Saturday. Forster had three seconds at Doomben on Saturday with Malvern Estate, Archade and Chapter and Verse. “They were all very good runs so we can look to the future with a bit of confidence,” she said.